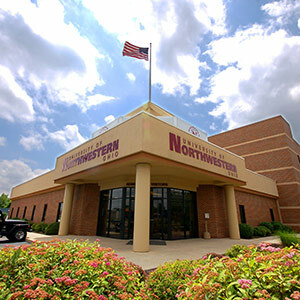 The University of Northwestern Ohio offers the 100% online Master of Business Administration for working adults seeking career advancement amid a busy lifestyle. This convenient advanced degree is taught by doctorate-level faculty who are experienced business professionals and educators. At UNOH, we’re committed to providing an affordable degree option to help our students catapult existing careers to new heights or to pursue higher levels of new employment. Our MBA courses are 100% instructor-led and can be completed in less time and with less debt than other university MBA programs. With almost 100 years of experience as a higher education provider, our reputation for providing relevant, real-world expertise is growing. Some of the most forward-thinking Fortune 500 companies like Amazon and Disney employ distance learners from UNOH. Find out why. Read more about our comprehensive online MBA program or contact one of our Enrollment Representatives. Our high-quality curriculum teaches current and traditional best practices related to business administration. Students will find coursework relevant and helpful to their current and future job responsibilities in leadership, administration, global business and strategy, organizational behavior, finance, and ethics. Guided instruction, a comprehensive student orientation, and faculty who are specifically trained in distance education help working professionals to obtain this degree in as little as 18 months. Because this 48-credit hour program is taught on a flexible quarter system, our students can learn at a steady pace by taking either one or two courses per quarter, while enjoying time off between each term. UNOH proudly offers our quality online MBA program with no GMAT or GRE required. The personalized approach our admissions team takes with every applicant allows those with a wealth of real-world business experience and potential to seek an online MBA without restrictions from test scores.